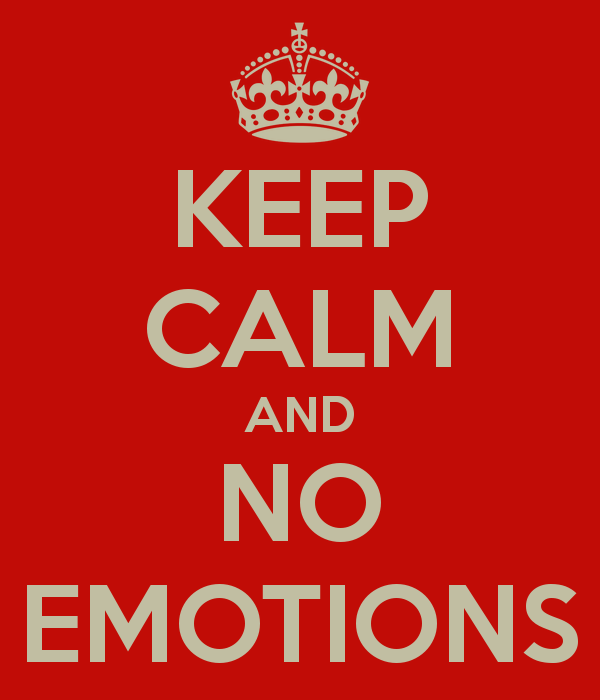 © http://www.keepcalm-o-matic.co.uk/p/keep-calm-and-no-emotions-5/ I have no rights to this image. I recently took the girls to see Inside Out. Dare I say, it seems to be a much better movie than Frozen, with a more relevant message: we need all of our emotions to be a whole person. But this is not a movie review. No. Over the past few months, I’ve noted how people interact with one another, and consequently, tend to attempt invalidating each other’s emotions. #1 Manage the Person’s Feelings My Grannie does something I call managing my emotions. When I tell her about the coworker that upset me, she says, “Don’t be angry.” Someone hurt my feelings? “Don’t be sad.” She feels that I’m about to explode over some issue that’s trivial in her mind? “Don’t go off!” I resist each step of the way because emotions are a huge part of my personality. If I cannot express my emotions, then I might as well curl up in a ball and be invisible. Simultaneously, I see this as a way to not really see someone’s emotions. I know she means well. However, it is the number one way to invalidate someone’s emotions. #2 Say, “It’s Not that Bad, Is It?” If someone has the cojones to tell you how they feel about a situation or to express how your actions have made them feel, the number two way to invalidate their emotions is to ask them if it’s that bad. If it wasn’t that bad, then he or she probably wouldn’t have expended the energy to pour out his or her heart to you. If it wasn’t that bad, then perhaps, he or she would have merely sucked it up, buried it deep and then held it against you for the rest of his or her life. But instead, he or she chose to tell you because he or she thought you cared enough to react. Let’s assume that it really was that bad. #3 Ignore the Person’s Statement What if someone said, “I love you”? Would you ignore the sentiment? How about if someone said, “Hey, I think you’re a great person!” Would you think that deserved a response? The reality is that it’s way easier to respond to positive emotions. Oh my Gosh! You love me? I love you too! But if that same person announced, “You really hurt my feelings,” or “You’ve made me sad by being inconsiderate,” a lot of times, the recipient doesn’t understand how to relate to these negative emotions. And ignoring takes the place of responding. However, ignoring someone’s emotions is also a way to invalidate what the person just said. #4 Deflect the Person’s Emotion Deflecting is interesting. It’s the opposite of reflecting. And everything that I’ve read so far suggests that if you notice someone else’s bad behavior then really it’s a RE-flection of something you probably need to work on. DE-flecting, conversely, is a way to not internalize the other person’s emotions, right? When I deflect, then I put it back on you. What’s wrong with you? Why do you feel that way? What are you saying? I’m not like that. I wouldn’t do something negative to someone. If you’re not reflecting, then you’re probably deflecting. And if you’re deflecting, then you’re probably invalidating someone else’s feelings. Do you have other ways that you would add? How do you try not to invalidate others’ feelings? Would you re-order these? This is such a great post. It is a very real reminder to me to stop telling my daughter “This to shall pass.” and to hear her out, listen to more deeply, and with more empathy. Thank you. Oh, I also enjoyed the movie and think it’s been a great way to start conversation about emotions. I loved this post! I try to be so careful with this, especially as a parent. It’s so easy to brush aside their inexperienced emotions, but so hurtful! It really, really is. I have to remind myself that whatever kids are experiencing right now is important to them. Oh, I have one that is burning me up right now! Making a joke about what you said! I posted something on a neighborhood website letting people know that someone had opened my unlocked car and took my digital camera. A neighbor I don’t know replied back “oh no! I left my car unlocked and running and it got stolen, help me!” I responded back that I didn’t feel like I deserved to be publicly embarrassed for a simple mistake and he responded, “I was just joking.” Steam…out…ears. Good one Afthead! And sorry about your camera. Cameras are expensive and that sounds awful. The guy’s response is pretty jerky. Oh he sent me a long email explaining to me how he was a great guy and he just wanted to get a little humor in our neighborhood discussion and I should keep sharing. He pissed me off again with his apology note! Oddly I got the camera back. The thieves dropped it in my neighbors car when they broke the screen, so at least I have the pictures. Aaaah! Yes I’ve been told that I need to control my emotions simply because I have some. I’ve wondered if some of it is cultural or if we just do it to one another as humans. Thanks for making me think a little more. I have to say I could really relate to that movie.. You can’t just ignore one feeling because it will get to you eventually. Totally agree Miusho! Thanks for the read and the comment!